We woke up early, we sipped tea, and we wept at the beauty that was Prince Harry and Meghan Markle’s royal wedding. Since the Saturday, May 19th ceremony and reception, we’ve been eagerly awaiting the release of the formal royal wedding photos. And on May 21st, Kensington Palace finally delivered. The photos of the Duke and Duchess of Sussex and their wedding party are pure magic (talk about a modern family). But it seems as though the youngest bridesmaid was decidedly less-than-enthused. 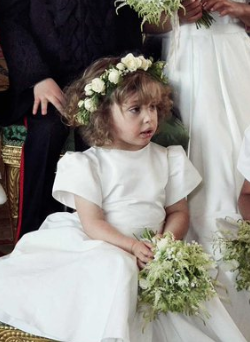 Four-year-old Prince George, son of Prince William and Kate Middleton, is usually one to bring the sass to a royal occasion, but little Zalie Warren took home the award for “best unimpressed face of the night.” In the bridal party photos, two-year-old Zalie, Prince Harry’s goddaughter and daughter of Jake Warren, son of Queen Elizabeth’s racing manager, was more than ready to call it a day. While her cohorts said cheese for the camera, Zalie’s attention was elsewhere — perhaps on the royal wedding cake. Here was one of the initial group pics, just for some necessary context. Now let’s get a little closer to tiny Zalie. Perhaps she heard that the appetizers were ready. All of the kids, Zalie included, were absolutely adorable during Saturday’s service — impressed or not. Sitting still for photo-taking may not have been Zalie’s cup of tea, but we hope she enjoyed the rest of the reception.